Haven't moved on a Monday for a while. It was hard to get up this morning after our big walk. Jimmy's up first per usual. I got up after 8. There's so much to do in the morning. I made a smoothie first some eggs for Jim. And didn't even sit in my chair this morning, immediately started getting ready. It was after 10 a.m. till we finally left, I know Jim wanted to leave earlier, but that's on me. 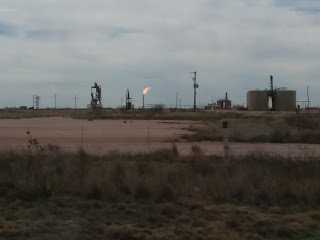 We only had three quick stops, we were on back roads, and travel service roads for the trucks and a ton of oil fields everywhere. A lot in NM and Texas. We pulled over alongside the road for a quick potty break. Then we each had a date nut ball and kept driving. Later there was another rest area but it looks strange so we just pulled along the road for another potty break and grab lunch took it in the truck and ate. Then later we found a place to get diesel. And then we kept On Truckin, we drove total about 280 miles today, about four and a half hours driving. And arrived at Abilene Texas, KOA. We got set up and Jim went to fill the truck up with diesel and came back, we had them deliver a bundle of wood in a fire ring to use for the night. We shared a salad and I heated up the rest of the chicken casserole we sat by the fire for a little. Then I came in to watch The Voice. Yup West Texas scenery is mostly oil wells. Your time west flew by.